Loading docks are essential for offloading of materials at your facility. Having loading dock equipment that works and functions properly is necessary to keep operations running smoothly. The S. W. Betz Company sells, repairs, and installs various types of loading dock equipment. Some of the different types of loading dock equipment are described below. 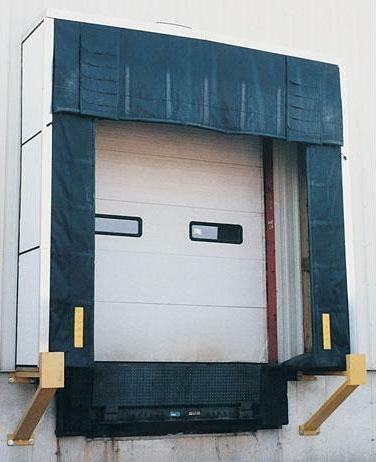 Dock bumpers help keep trucks from backing into the structural part of your facility. Laminated dock bumpers and rubber dock bumpers provide a cushion so that when trucks back into a loading dock space, the truck and the facility itself are less likely to be damaged. Loading dock bumpers usually have a projection of about 5” and can vary in both height and length. The S. W. Betz Company offers custom dock bumper solutions upon request. Aluminum dock plates are an easy and cost-efficient solution to loading and unloading trucks with pallet jacks and hand trucks. Dock plates bridge the gap between your loading dock and the truck to move materials across safely. All dock plates come standard with bolted on steel legs. This secures the aluminum dock plate in place between the trailer of your truck and the loading dock. They also come standard with hand holes that assist in the moving of the dock plates. The S. W. Betz Company offers aluminum dock plates with varying widths, lengths, and capacities to fit your needs. Aluminum dock boards are a heavier duty alternative to the aluminum dock plates. The aluminum dock boards again come in varying lengths and widths and have capacities of up to 15,000 pounds. Steel Dockboards are designed to meet the demands of those customers that require both high capacity and heavy usage. Steel dockboards are built with lifting loops so that they can be transported by fork lifts. These loops then recess back into the board for a flat surface to drive over. Steel dockboards are available in various widths and lengths and capacities of up to 60,000 pounds. Edge of dock levelers are primarily used at docks where the dock height and the trailer height are fairly equal (within 5”). An edge of dock leveler is primarily designed for forklift use and has capacities ranging from 20,000 to 30,000 pounds. The S. W. Betz Company has many years of experience of installing and repairing edge of dock levelers. Dock levelers are another product that the S. W. Betz Company has become very familiar with throughout their 80+ years in business. Dock levelers are designed for high-use loading docks; they quickly and efficiently bridge the gap between the loading dock and the trailer. Loading dock door seals do a few things. First, they help trailers create a tight, weatherproof seal against the loading dock. They also help in maintaining the structure of your facility, as it will deter trucks from banging into the facility itself. The S. W. Betz sells and installs loading dock door seals. The S. W. Betz Company represents many of the top dock equipment manufacturers in the country, including Koke, Inc. located in Queensbury, New York and Pioneer Loading Dock Equipment. If you are in need of or would like more information on any of our loading dock equipment, please contact us and one of our team members will be happy to assist you. For more information about Loading Dock Equipment or any other product or service from S.W. Betz, fill out and submit the form to the right.